Washington is a town in Sullivan County, New Hampshire, United States. The population was 1,123 at the 2010 census. Situated in a hilly, rocky, forested area, and with 26 lakes and ponds, Washington is a picturesque resort area. It is home to Pillsbury State Park. Granted in 1735 by Colonial Governor Jonathan Belcher of Massachusetts, the town was one of the fort towns designated to protect the colonies from Indian attack, named "Monadnock Number 8". In 1751, the town was granted by Governor Benning Wentworth as "New Concord". As the grant was never settled, the charter was revoked. Reuben Kidder of New Ipswich acquired the grant, naming it "Camden". The first settlers arrived in 1768 and built log houses. By 1773, the community had 132 inhabitants. On December 13, 1776, the newly established American revolutionary government incorporated the town as "Washington", after George Washington — the first named in his honor. By 1830, the population had grown to 1,135. Using water power from the streams, mills manufactured lumber, barrel staves, shingles, chair parts, bobbins, whip sockets, hosiery, bricks and washboards. Gristmills ground grain. Sheep farms, producing wool and mutton, were an important business. In 1840, there were 200 farms. 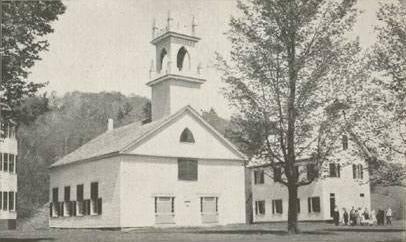 Tubbs Union Academy was founded in 1849, and although it did not last long, the school once enrolled over 100 students from New Hampshire and beyond. The first Seventh-day Adventist church was established in Washington in 1862. In 1886, the town produced 53 tons of maple sugar. The railroad era brought tourists, and hotels were built on the lakes and ponds; however, with 19th-century migration to the Midwest, the town's population dwindled. As of 1960, it contained only 162 inhabitants. Washington has grown since, as its scenic beauty attracts tourists and retirees. The town contains significant examples of early architecture, including the Town Hall, built as a meetinghouse in 1787, the Congregational Church built in 1840, and the first Seventh-day Adventist Church built circa 1843. Washington is bordered by Goshen to the northwest, Newbury and Bradford to the northeast, Hillsborough and Windsor to the southeast, Stoddard to the south, Marlow to the southwest, and Lempster to the west. As of the census of 2000, there were 895 people, 370 households, and 277 families residing in the town. The population density was 19.7 people per square mile (7.6/km²). There were 925 housing units at an average density of 20.4 per square mile (7.9/km²). The racial makeup of the town was 98.21% White, 0.34% Native American, and 1.45% from two or more races. Hispanic or Latino of any race were 1.45% of the population. There were 370 households out of which 24.1% had children under the age of 18 living with them, 67.8% were married couples living together, 4.1% had a female householder with no husband present, and 24.9% were non-families. 19.5% of all households were made up of individuals and 9.5% had someone living alone who was 65 years of age or older. The average household size was 2.42 and the average family size was 2.73. In the town the population was spread out with 21.9% under the age of 18, 3.5% from 18 to 24, 24.6% from 25 to 44, 32.2% from 45 to 64, and 17.9% who were 65 years of age or older. The median age was 45 years. For every 100 females there were 104.8 males. For every 100 females age 18 and over, there were 100.9 males. The median income for a household in the town was $43,125, and the median income for a family was $50,000. Males had a median income of $34,688 versus $26,333 for females. The per capita income for the town was $20,540. About 3.1% of families and 5.0% of the population were below the poverty line, including 8.1% of those under age 18 and 5.7% of those age 65 or over. Sylvanus Thayer, US Army colonel; known as the "Father of West Point"
This page uses content from the English language Wikipedia. The original content was at Washington, New Hampshire. The list of authors can be seen in the page history. As with this Familypedia wiki, the content of Wikipedia is available under the Creative Commons License.